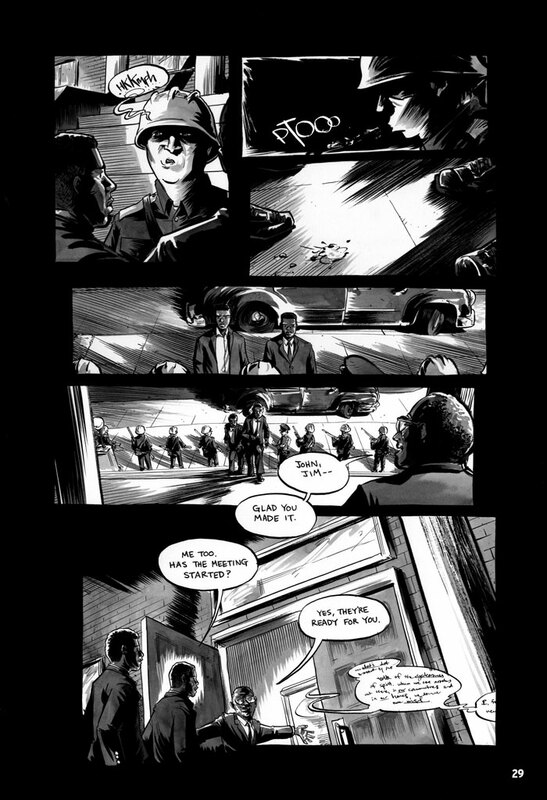 With phrases like “rigged” and “voter fraud” dominating our headlines in recent weeks of the presidential campaign, it’s informative to read US Sen. John Lewis’ final book in his graphic autobiography series in which Lewis details the Civil Rights Movement’s push to force the federal government to enforce laws that allowed black voters to register in the 1950s and 1960s. The Civil Rights story puts the current events in perspective, particularly when you read about the violence and the unfairness of the voting system. Plus, the hate. You can’t escape the hate. Lewis’ story also reminds you of how far our nation has come, even if the headlines give us pause. And yes, it also is a call that we still have far to go when it comes to race, prejudice and injustice. 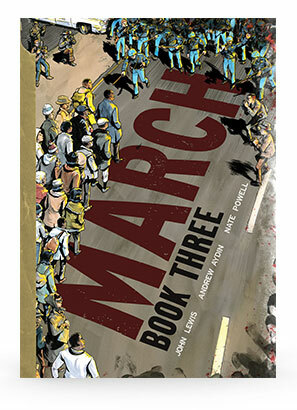 March: Book Three is the final installment in Lewis’ re-telling of his work as a young leader with the Civil Rights movement. The three books are framed around the famous Selma March that changed the way the nation saw the unfairness of the Alabama laws, and other states that were also discriminating against black voters. Like the first two books in this series, March: Book Three is a powerful piece of raw, visual storytelling. Lewis’ voice is front and center, as is his struggle to remain peaceful and true to his beliefs in the face of institutional violence. 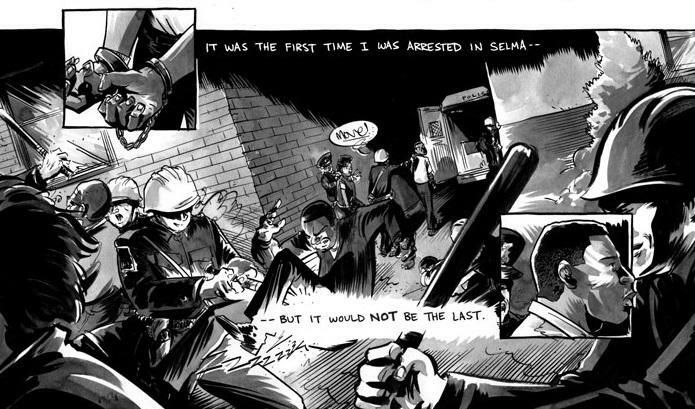 In the first Selma March, now called Bloody Sunday, Lewis suffered head injuries from a police officer’s baton. Here, Book Three begins where the last book left off — with the bombing of the church in Birmingham where four girls were killed and dozens others injured — and ends with the Selma March. Woven in and out of the past is something more current — Senator Lewis watching Barack Obama becoming the first black president of the United States, something nearly unimaginable in the turbulent times of the 1960s. Like the other two books, this one is not appropriate for middle school readers (and certainly not for elementary students) due to violence and language, but it will resonate with high school readers, particularly those who know only the larger stories of the Civil Rights Movement. The March graphic novels give us the nitty gritty details of organization and resistance, and the slow shift of change. It also reminds us of the dedication of so many people who sought to change our country’s fabric. Many paid a terrible price for their work. Note: Lewis is listed as one of the authors of the March series, along with Andrew Aydin. The artwork in the series was done by Nate Powell. Wanted to catch up on your blog and was thrilled to see your review of March. John Lewis is big stuff down here in my ‘hood. He is coming in a few weeks to our school and spoke at my daughter’s baccalaureate. A finer man you will never meet. Am so pleased that you chose to share words about his graphic novels. Wow … meeting him would be wonderful … what an honor for your school … thanks for catching up. I miss bumping into you. Let’s do that more often ..